Smart phones are ubiquitous in modern life. But if you’re the type of person who hates having to carry around a mini-computer in your pocket, a new Kickstarter campaign has a solution. A credit card-sized cell phone designed to be used as little as possible. The Light Phone does nothing but make phone calls. No games, no texts, and no Twitter that you incessantly checkup. It can piggyback onto your smartphone service so that you don’t have to go completely cold turkey. But you can at least leave the house with no access to social media while still being able to make and receive emergency calls. The phone has its own number. But it also connects to an app that can forward all calls from your pre-existing number. The device also has a simple clock, a touch pad for entering numbers and 20 days of battery life. In theory, buying a simple flip phone or burner phone could achieve the same goal. 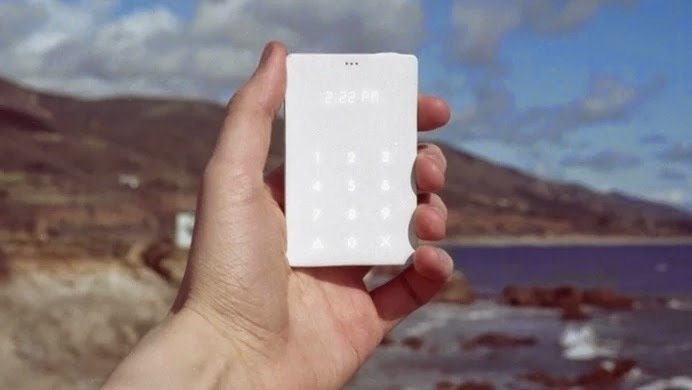 The Light Phone, though, is much thinner (seriously, you can fit it in your wallet) and in theory easier to connect to your existing number. Because of its simplicity the Light Phone is incredibly small and light, with the 3D printed shell being about the size of a credit card. A high resolution display is out of the question as well; instead the display is dot matrix LED which lights up, so you can view it in the dark. You can connect the Light Phone up to your existing smartphone via an app that forwards calls to it. However if the thought of lugging around a normal smartphone just to use the Light Phone seems a bit, well, pointless, the Light Phone also comes with a SIM card, so you can use it as an unlocked handset. The Light Phone costs $100 to pre-order. The project has already gotten more than $120,000 in backing, and is looking to raise $200,000 by June 27. The phones are expected to ship in May 2016. The phone comes with a SIM card with 500 minutes and a mini USB charger.